Offer is valid only in Bangalore. Columbia Asia is an international private healthcare group operating a chain of modern hospitals across Asia. The Columbia Asia Group is owned by more than 150 private equity companies, fund management organizations and individual investors and Mitsui Corporation. Columbia Asia Hospitals Pvt. Ltd.is one of the first healthcare companies to enter India through 100% foreign direct investment (FDI) route. The first hospital in India commenced operations in 2005 in Hebbal Bangalore and currently Columbia Asia operates twelve facilities. The group has presence in Ahmedabad, Bangalore (5 hospitals), Mysore, Kolkata, Gurgaon, Ghaziabad, Patiala and Pune. The hospitals aim to be the preferred choice of healthcare services for families and businesses. With around 100-200 beds per medical facility, the buildings showcase smoother patient flow, new medical technologies and tertiary care, through which the efficiency of patient care is optimized resulting in a shorter length of stay. In turn, this results in transparency in rates with better affordability for patients. But as progressive as medical technology can be, the difference in healthcare relies much on its people highly skilled medical consultants, caring nurses as well as teams of committed staff who see to every patient s needs, on the road to recovery. 2. Valid at Columbia Asia Hospital, Bangalore. 5. Package Inclusion: CBC , Blood Grouping - ABO & Rh, Blood Glucose Fasting , Glucose, Post Prandial (PP), 2 hours, Lipid Profile, Liver Function Test , Serum Creatinine , Serum Calcium , PSA ( Male ) , HBA1C, TSH, Stool Routine, Urine Routine , Ultrasound Abdomen & Pelvis , X- Ray Chest , ECG , Stress Test * / Echo, Consultation with Doctor, Special Consultation- ECHO/TMT, Consultation with Ophthalmologist , Dental screening, Dietician Consultation Charges-OP & Breakfast. 6. 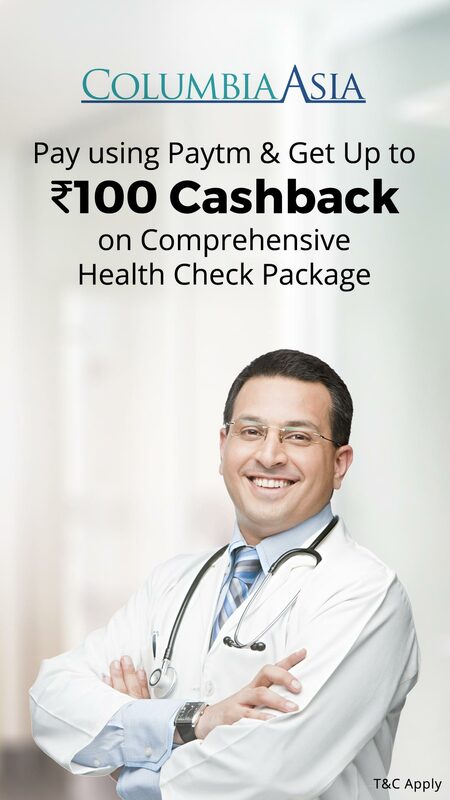 Comprehensive health check up package above 40 Years (Male) worth Rs.6000.